Whoosh! You look up from your hiking boots as a dragonfly nearly collides with your shoulder. It continues on, past your shoulder, and settles down on nearby lily pad just a few yards out in the lake. Suddenly, the water explodes. The dragonfly disappears in the surge of water and after a few short seconds, all is calm again. Welcome to a typical evening at Shabbona Lake State Park. With 318 acres of lake and 1,550 acres of rolling prairie and forest, wildlife encounters at Shabbona Lake State Park are as common as campfires on a starry night. Chances are if you enjoy nature or fishing, a visit to Shabbona Lake State Park has happened at some point in your life. Located about 60 minutes from Chicago, Shabbona Lake is home to four state records for Muskie and is well known for its fishing adventures, hiking trails, and campsites. About 475,000 visitors make a trip to Shabbona Lake every year. This high number of tourists contribute to the rising growth and success of the Village of Shabbona and surrounding communities. To keep visitors returning each year, the overall health of the park and the lake must remain intact. Back in the early 1990’s, a small five-acre pond on the far north end of the lake was constructed. This rearing pond became home to hundreds of fingerlings (small baby fish). The rearing pond allows baby fish to reach juvenile adult size before they are released into the main lake. With a large number of predator fish in the lake, this process increases the survival rate of the fingerlings. Over the next 20+ years, the rearing pond began to fill with sediment from small riverbeds to the north. Eventually, the sediment grew so deep that the pond became shallow, clogging and blocking the water flow into the lake. Due to the cost of repair and lack of funding to implement the project, the rearing pond ceased operation in 2014. With the rearing pond shutdown, the only option for restocking the lake came through the purchase of larger fish; a significantly more expensive option. Shabbona Lake was facing an immediate challenge with a long-term impact. As fishing pressure continued on the lake, how long would it take visitors to notice the reduction in fish? If fishing declined on the lake, what are the effects for Shabbona Lake tourism and the local economy? 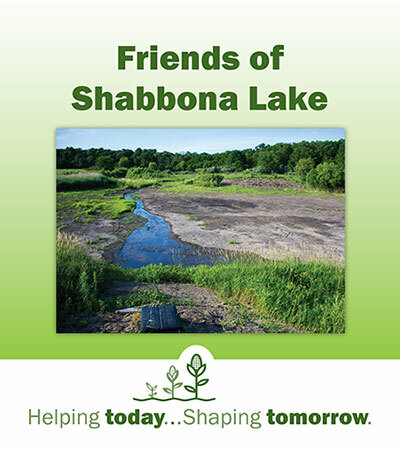 In 2016, a group of dedicated supporters called “Friends of Shabbona Lake” got together and applied for a grant from the DeKalb County Community Foundation. Through generous donor support to Community Impact funds, funding is available for projects such as fixing the rearing pond through the Community Needs Grant program. In a few months’ time, the Friends of Shabbona Lake received a grant for $12,000, leveraged over $5,000 of their own local funding, and began repairs to the rearing pond. Local contractor Kyler Excavating began work in November 2016 and completed the project in June 2017. The first step was to dig a deeper channel where the water drains into the lake. Once complete, the next step was installation of drainage tiles and new piping with an anti-seep collar. The final step was to remove sediment and reshape the pond for better drainage. After some challenges with a rainy spring and summer, the project has reached completion and the rearing pond is ready for operation. Over the next few months as water collects, the pond will slowly begin to fill. In spring of 2018, after the ice melts, fish will added to the rearing pond. Through ongoing donor support to Community Impact funds, the Community Foundation works diligently to respond to needs and opportunities in communities throughout DeKalb County. All made possible through the generosity of donors (thank you!) who want to make a difference. If ‘giving where it’s needed most’ inspires you, consider making a gift to an existing Community Impact fund or start a fund of your own. For questions or more information, please contact Executive Director Dan Templin at 815-748-5383 or dan@dekalbccf.org.